Prices good for on-hand quantity and time only. Visit Kirk's Korner 90+ point wine cabinet. We carry a great selection of 90+ point wines from around the world. It doesn't need to be expensive to be a great wine! Visit Kirk's Korner for your wine selections. York area's largest and best wine selection. Buy your Nebraska James Arthur Vineyards, Superior Winery and other Nebraska wines at Kirk's Korner. Kirk's Korner carries an excellent selection of Wines from around the World and our California wines are second to none! We carry wines for the price conscience customers to the higher end, world class wines for the discriminating buyer. Many customers request us to bring something in special and, if possible, Kirk's Korner finds that special selection for them. 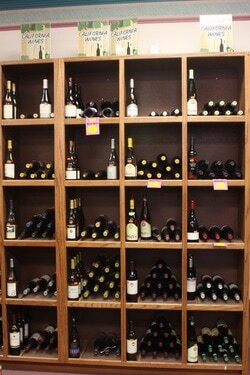 In our wooden shelving, you'll find our finer wine selections. Come, visit and let us know how we did! Specials are listed below. All sales are final. Don't forget to try out some of our specialty drinks for wines - champagnes, liqueurs and unique drink blenders. Kirk's Korner continually brings in new wines for our customers along with the tried and true wines! Wines are a joy to experiment with, either for you and yours, a wedding party, friends, bridge club or girl's night out, holidays, or whatever special occasion you choose. Wine goes great with any meal, anytime .... special occasion or not! Wine is a rather unique beverage that continues to mature in the bottle. Just because wine might have turned a deeper red or a yellowish white does NOT mean the wine is no longer good. When wine turns bad, you will know it immediately by it's odor; a strong vinegar odor, as vinegar was first made and filtered from wine gone bad. Mature wines can be "saved" rather simply by folding a filtering item such as cheese cloth a couple times and then slowly strain the mature wine through the filtering device into your wine decanter. This process mostly removes sediments (which is a natural substance in maturing wines) and allows air into the wine to rejuvenate it. Try it and you will see that you can continue to enjoy your wines longer.